Wilcox County is a county of the U.S. state of Alabama. As of the 2010 census, the population was 11,670. Its county seat is Camden. 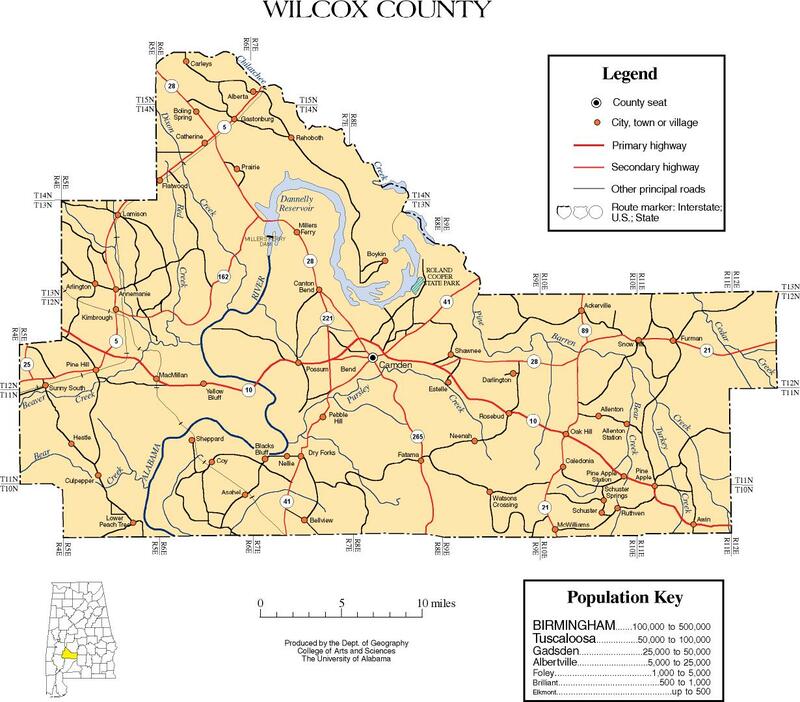 Wilcox County was established on December 13, 1819. The county was named after Joseph M. Wilcox, a US Army lieutenant who was killed in Alabama during the Creek War. According to the U.S. Census Bureau, the county has a total area of 907 square miles (2,350 km2), of which 888 square miles (2,300 km2) is land and 19 square miles (49 km2) (2.1%) is water. As of the 2010 United States Census, there were 11,670 people residing in the county. 72.5% were Black or African American, 26.8% White, 0.1% Native American, 0.1% of some other race and 0.4% of two or more races. 0.6% were Hispanic or Latino (of any race). As of the census of 2000, there were 13,183 people, 4,776 households, and 3,376 families residing in the county. The population density was 15 people per square mile (6/km2). There were 6,183 housing units at an average density of 7 per square mile (3/km2). The racial makeup of the county was 71.90% Black or African American, 27.51% White, 0.14% Native American, 0.13% Asian, 0.02% Pacific Islander, 0.11% from other races, and 0.19% from two or more races. Nearly 0.74% of the population were Hispanic or Latino of any race. There were 4,776 households out of which 36.00% had children under the age of 18 living with them, 39.80% were married couples living together, 26.50% had a female householder with no husband present, and 29.30% were non-families. Nearly 27.50% of all households were made up of individuals, and 11.90% had someone living alone who was 65 years of age or older. The average household size was 2.70, and the average family size was 3.31. In the county, the population was spread out with 30.70% under the age of 18, 9.10% from 18 to 24, 25.50% from 25 to 44, 21.00% from 45 to 64, and 13.70% who were 65 years of age or older. The median age was 34 years. For every 100 females, there were 87.20 males. For every 100 females age 18 and over, there were 81.00 males. The median income for a household in the county was $16,646, and the median income for a family was $22,200. Males had a median income of $26,216 versus $17,274 for females. The per capita income for the county was $10,903. About 36.10% of families and 39.90% of the population were below the poverty line, including 48.40% of those under age 18 and 32.10% of those age 65 or over. Similarly to all of the Black Belt, Wilcox County leans heavily towards the Democratic Party. The only Republican to carry the county since 1900 has been Barry Goldwater in 1964 – when little to none of the county’s black majority had voted for over seven decades and opposition by the voting white minority to Civil Rights meant that national Democrat Lyndon Johnson was not allowed on the ballot. Even after the Voting Rights Act of 1965, black registration was so slow that segregationist George Wallace comfortably carried the county in 1968, but since then the Democratic presidential candidate has carried Wilcox in every election. It was one of only six Wallace counties[a] to vote for George McGovern against Richard Nixon’s 3,000-plus-county landslide of 1972. All public schools in the county are operated by the Wilcox County School District. It is also served by one private school, Wilcox Academy, founded in 1970 as a segregation academy. The public schools are effectively all-Black. Major industries in the county include a paper mill operated by International Paper, based in Memphis, Tennessee, on the Alabama River near Pine Hill that employs roughly 400 people, and a copper tubing plant owned by Golden Dragon Copper Group of Xinxiang, China in Sunny South that opened in 2014; it employs approximately 300. Wilcox County is home to Roland Cooper State Park, Lake Dannelly, and Bridgeport Beach. ^ "Wilcox County, Alabama". The Association of Religion. Retrieved March 22, 2015. ^ "Schools". Wilcox County Schools. Retrieved March 3, 2013. ^ Carla Crowder (October 27, 2002). "Private white academies struggle in changing world". Birmingham News. Archived from the original on November 15, 2012. Retrieved March 3, 2013. ^ Mitchell, Ellen (September 11, 2012). "International Paper Co. plans $27 million maintenance project for Pine Hill mill". Press-Register. Retrieved May 3, 2013. ^ McDonald, George. "Crews Clearing Site of Golden Dragon Copper Plant in Wilcox Co". WAKA CBS 8. Bahakel Communications, Ltd. Retrieved May 3, 2013. ^ The others were the fellow Alabama counties of Bullock and Lowndes with similarly delayed black registration after 1965, and the white majority, historically secessionist Middle Tennessee trio of Houston County, Perry County and Stewart County. This page was last edited on 12 December 2018, at 21:37 (UTC).